I’m calling this my “Merry Christmas Millet Salad”… because why wait until January to eat a little lighter and brighter? 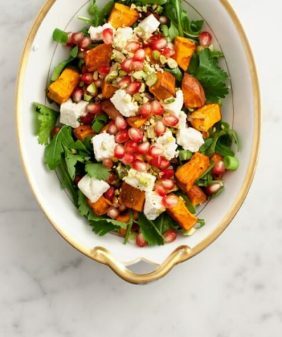 This salad is full of everything I love – pretty pomegranates, pistachios, fennel, & mint… and it’s tossed in a light but tangy tahini dressing that’s sweetened with big squeezes of orange. If you don’t have millet, you could just as easily sub quinoa. I use the two pretty interchangeably (especially when I forget to label my bulk bin bags). What I love about millet is that it almost tastes like semolina couscous, but it’s entirely gluten free and a healthy whole grain. It works really well here with the sweet nutty flavors of the pistachio & tahini. I hope you all have a merry Christmas and a happy, healthy holiday! 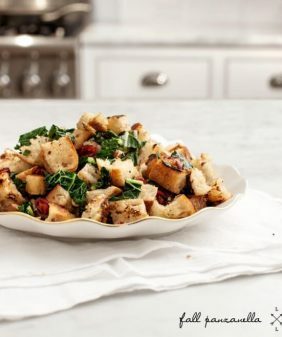 Whisk together the dressing ingredients, taste and adjust seasonings. Set aside. Optional step: toss your chickpeas in a small skillet w/ a little olive oil, salt and pepper until browned. Toss together all salad ingredients with enough dressing to coat (you don't have to use it all). Taste and adjust seasonings. Why wait indeed! Filled with colour, this is all I want right now. Yum! 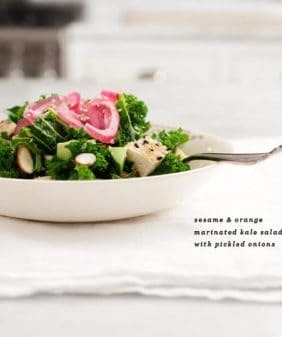 This looks so wonderful – full of fresh flavours and vibrant colours! exactly what I want! Love all the vibrant, fresh flavors in this salad. I often forget about mint in the winter, but it’s such a great addition. Can’t wait to make this! What a gorgeous salad! I’ll bet it is delicious. With all this holiday baking and splurging, I am in need of something fresh! I totally agree…why wait till January 1st?! 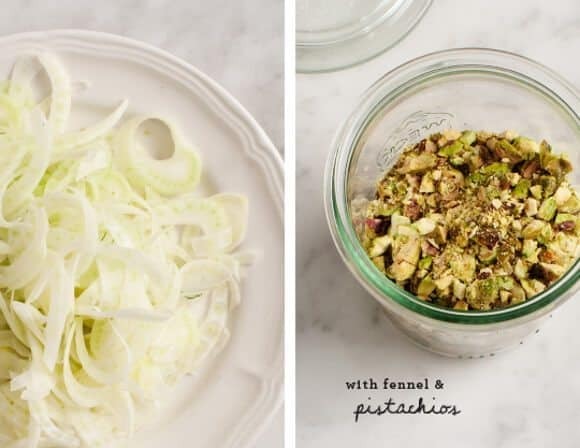 And fennel is something that needs to be in my usual rotation..I love the anise flavor! Absolutely beautiful! The colors are awesome, and LOVE that bowl. Beautiful way to brighten up a winter day! It’s in the 80s here in Florida, so it’s perfect for our Christmas menu! A great, healthy holiday meal! What a cheery festive salad. I love the contrast of the two sharp flavors. AND I like the bowl you chose for presentation. It really showed off the salad. Thanks Carol – I can’t get enough of that bowl! 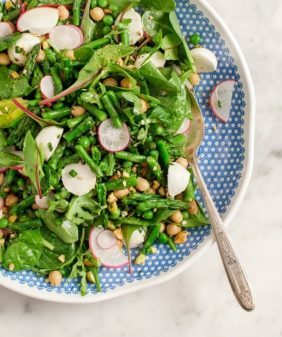 This minty millet salad looks so incredibly delicious, I can’t wait to try! Wishing you a very happy New Year! you too, Amanda, thank you! This salad combines all of my favorite things. Pistachios, chickpeas and pomegranate seeds on everything please! Salads with quinoa are my go to lunches at work. They are so filling and full of nutrients. I’ll have to give this one a shot while pomegranate seeds are still readily available. 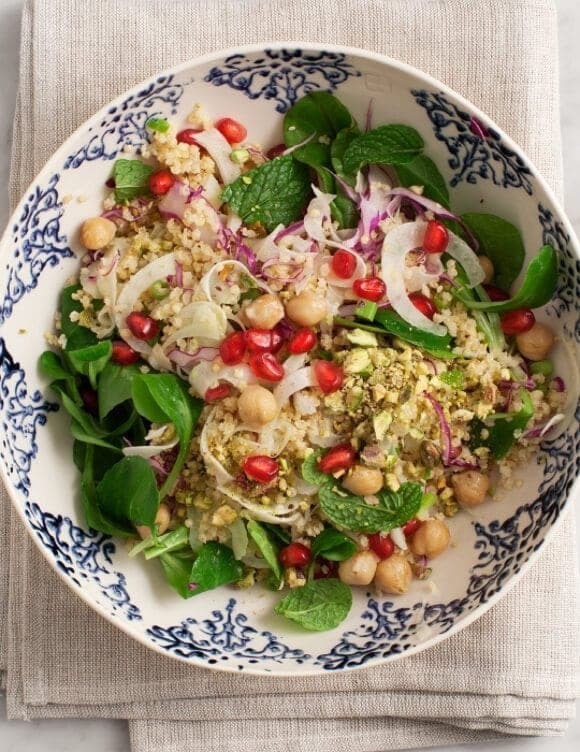 Love salads with mint and pomegranate. I have not use millet much but it would be good to try. Love this recipe! Growing up in a Persian home, I was raised eating pomegranate all the time. 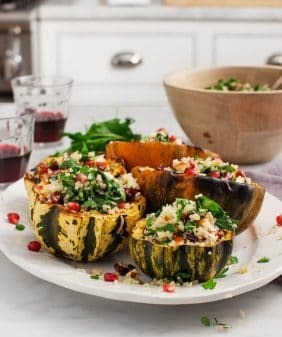 I’m always looks for new recipes that use pomegranate since I usually just eat it plain with some salt! It was so tasty and to delicious.Love it…i want you all try this also please.. I looove tahini dressings! Tahini adds so much richness, it’s hard to believe it’s a vegan product. 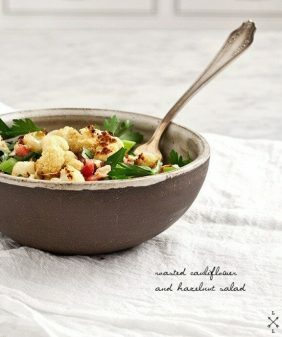 This has been my go to salad for the last month! Love the fennel and mint. Now that pomegranates aren’t in season any more, I’ve been wondering what I should substitute for that bit of sweetness, without adding any dried fruit. Ideas? Hmm, I was going to say dried fruit before I read your last sentence :). I often make this with dried currants – which I love because they’re tiny and just a little bit sweet. Let me know if you come up with a better idea to sub in! I am searching for clean food recipes these days, this recipe is just for me. What do you think about quinoa instead of millet? Quinoa would work just fine! I love the test of the salad, what about if I did,t find fennel ?? What I use instat of fennel ??! Difficult to find fennel in my city what can I use instant of it ? !